The Fellowship was fortunate enough to obtain a copy of THE HYPERNATURALS #1 from Boom! Studios. Dan Abnett and Andy Lanning write, and Brad Walker and Andres Guinaldo draw. Earth has a problem, and when it has a problem, it calls in the Hypernaturals. But this time the problem is the disappearance of the Hypernaturals. So Earth calls in a pair of retirees and a couple of kids who didn’t quite make the team to go investigate. And all of the leads point to an old villain who’s still in prison, and the team sets off another trap. This book is set in a future where humans have spread throughout the galaxy. It doesn’t give any hints about the origin of supers, but I think it will be fun to explore that later. It also plants a seed with Hatch that will surely turn into high drama later on. Add to that the stylized art, very fitting to the futuristic setting, and it all blends together. This is a solid beginning with plenty of room for expansion and development. Lots of options for exploring history and relationships, and lots of explosion potential. Overall I think this is one to follow. 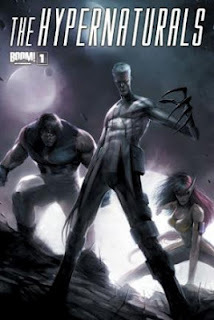 THE HYPERNATURALS #1 is available now at your FLCS or by order from boom-studios.com.